Not everybody can create invoice or establish estimate with this software. 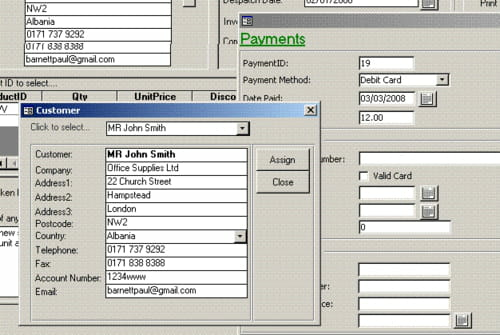 Invoicing and Quotating Billing offers a customizable and user-friendly interface to create any type of invoice. Record: with this tool, you can have the details of all work that has been undertaken as well as the closed invoices and also the bank details of the payments made. Users can also create a cashbook for the record of the invoice’s status and amounts. Insert: users can also insert in their database all information about clients, employees, payment methods as well as shipping address. Printing: Invoicing and Quotating Billing offers a printing option. It allows printing quotations, cashbook, payment history, contacts/customer list, invoices by date, invoices closed, invoices unpaid, parts discontinued as well as parts list. Other features: users have the opportunity to email clients, to launch search for invoices and quotations and assign package prices to quotations. Apart from that, they can also create a product stock list, Outlook compatible email, tasks and appointments. This software is fully compatible with MS Access database. You can export your data into MS Excel. Latest update on November 20, 2016 at 04:30 PM.